Ruby 3x3 - Ruby 3 Will Be 3 Times Faster - What’s News? Ruby 3 - the next major update of ruby (planed for 2020) will be 3 times (3x) faster than Ruby 2. Note: The baseline for Ruby3x3 is 2.0 so all the improvements in 2.x will count toward the 3x goal. An “enjoyable” benchmark for rubies to drive “Ruby 3x3: Ruby 3 will be 3 times faster”. The benchmark is a Nintendo Entertainment System (NES) emulator that works at 20 frames per seconds (fps) in Ruby 2.0. An original NES works at 60 fps. If Ruby 3x3 succeeds, we can enjoy NES games with ruby! NOTE: We do not aim to create a practical NES emulator. There are many great emulators available today. We recommend using another emulator if you want to play a game. 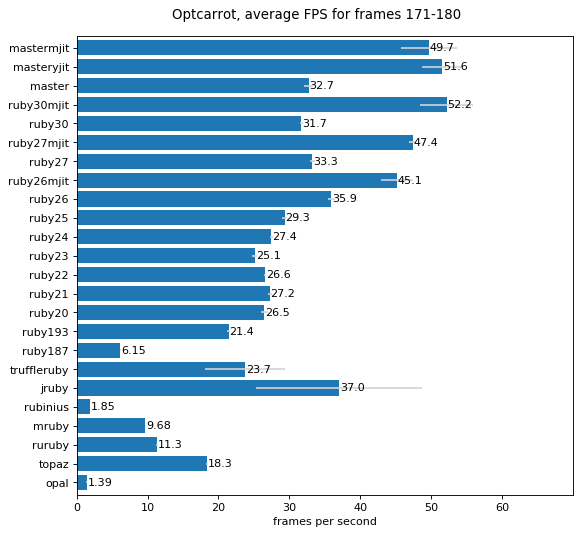 See Rubies Benchmark with Optcarrot for the measurement condition and some more charts. See the #Ruby3x3 hashtag on twitter for the latest Ruby 3x3 news bytes. What's Ruby 3×3? What's Optcarrot? Ruby 3 and JIT: Where, When and How Fast? How's Progress on Ruby 3×3?